BACKGROUND: Epstein Barr virus (EBV) is a gammaherpesvirus that is associated with nasopharyngeal carcinoma (NPC) and endemic Burkitt lymphoma (eBL). EBV carries several latent genes that contribute to oncogenesis including the latent membrane protein 1 (LMP-1), a known oncogene and constitutively active CD40 homolog. Variation in the C terminal region of LMP-1 has been linked to NPC pathogenesis, but little is known regarding LMP-1 variation and eBL. RESULTS: In the present study, peripheral blood samples were obtained from 38 eBL patients and 22 healthy controls in western Kenya, where the disease is endemic. The LMP-1 C-terminal region from these samples was sequenced and analyzed. The frequency of a 30 base pair deletion of LMP-1 previously linked to NPC was not associated with eBL compared to healthy controls. However a novel LMP-1 variant was identified, called K for Kenya and for the G318K mutation that characterizes it. The K variant LMP-1 was found in 40.5% of eBL sequences and 25.0% of healthy controls. All K variant sequences contained mutations in both of the previously described minimal T cell epitopes in the C terminal end of LMP-1. These mutations occurred in the anchor residue at the C-terminal binding groove of both epitopes, a pocket necessary for MHC loading. 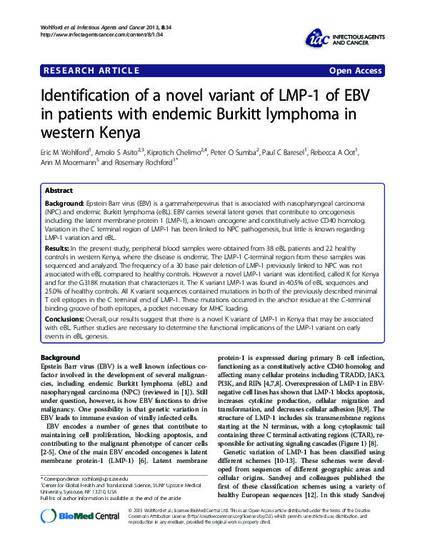 CONCLUSIONS: Overall, our results suggest that there is a novel K variant of LMP-1 in Kenya that may be associated with eBL. Further studies are necessary to determine the functional implications of the LMP-1 variant on early events in eBL genesis. Copyright 2013 Wohlford et al. ; licensee BioMed Central Ltd. This is an Open Access article distributed under the terms of the Creative Commons Attribution License (http://creativecommons.org/licenses/by/2.0), which permits unrestricted use, distribution, and reproduction in any medium, provided the original work is properly cited.